Io Sakisaka, the creator of Ao Haru Ride and Strobe Edge, is going to launch her new manga series in the July issue of Shueisha‘s Bessatsu Margaret magazine on June 13. Strobe Edge was serialized from 2007 until 2010 with a total of 10 volumes. 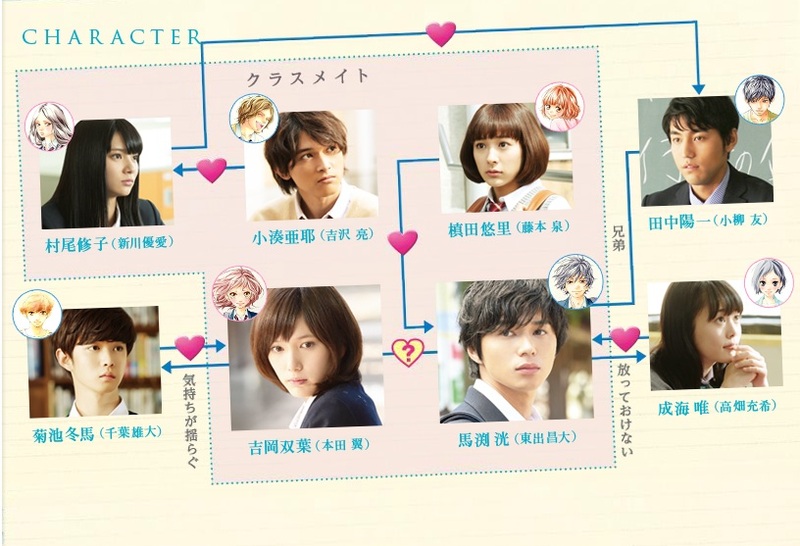 A live-action film adaptation, which stars Kasumi Arimura (Ninako Kinoshita) and Sota Fukushi (Ren Ichinose) will also be screened in March 2015. Io Sakisaka started Ao Haru Ride (Blue Spring Ride) in 2011, and the series is scheduled to conclude in February this year. It also inspired an anime adaptation series which was aired in July until September 2014. Production I.G. produced the anime which had 12 episodes. Ao Haru Ride’s live-action film adaptation was also released in Japan in December last year. Tsubasa Honda and Masahiro Higashide played the characters of Futaba Yoshioka and Kou Mabuchi, respectively. Posted in Manga and tagged anime, Ao Haru Ride, Bessatsu Margaret, Blue Spring Ride, Futaba Yoshioka, Io Sakisaka, Io Sakisaka New Manga, Io Sakisaka to Launch New Manga, Kou Mabuchi, live-action film, live-action film adaptation, manga, Masahiro Higashide, movie, Shueisha, Strobe Edge, Tsubasa Honda. Bookmark the permalink. Io Sakisaka, the creator of Ao Haru Ride (Blue Spring Ride) is going to end her manga next month according to the February issue of Shueisha ‘s Bessatsu Margaret magazine. The shoujo manga’s serialization started in 2011 and as of December 2014, 12 volumes have been released so far. An anime adaptation produced by Production I.G. was also aired in July last year, and the 12th and final episode was televised in September. A live-action film adaptation directed by Takahiro Miki was also screened in Japan on December 13, 2014. Tsubasa Honda and Masahiro Higashide played the roles of Yoshioka Futaba and Tanaka Kou, respectively. Izumi Fujimoto (Yuri Makita), Yua Shinkawa (Shuko Murao), Ryo Yoshizawa (Aya Kominato), Yu Koyanagi (Yoichi Tanaka), Yudai Chiba (Toma Kikuchi) and Mitsuki Takahata (Yui Narumi) also joined the cast. 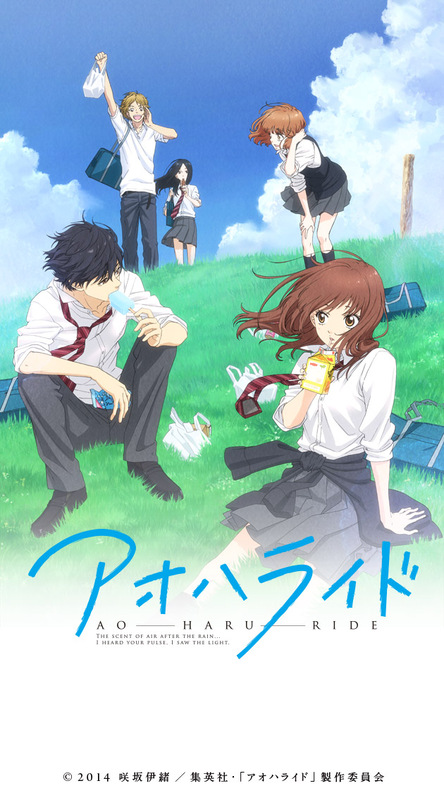 Ao Haru Ride (Blue Spring Ride) depicts the love story between Yoshioka Futaba and Tanaka Kou who both fell in love with each other when they were still in junior high. However, before she could even confess her feelings for him, Kou suddenly transferred and they lost contact with each other. Now that she is in high school, she unexpectedly reunites with Kou who changed his name to Mabuchi Kou. She realizes that she still has feelings for him, but the Kou she knew before is different now. In the course of their romance, they meet new people and friends who will also play a great part in their story. Posted in Manga and tagged anime, Ao Haru Ride, Aya Kominato, Bessatsu Margaret, Blue Spring Ride, Futaba Yoshioka, Io Sakisaka, Io Sakisaka to End "Ao Haru Ride ", Io Sakisaka to End "Ao Haru Ride" in February, Io Sakisaka to End Her Manga "Ao Haru Ride ", Izumi Fujimoto, live-action film adaptation, Mabuchi Kou, manga, Masahiro Higashide, Mitsuki Takahata, Ryo Yoshizawa, shoujo manga, Shueisha, Shuko Murao, Takahiro Miki, Tanaka Kou, Toma Kikuchi, Tsubasa Honda, Yoichi Tanaka, Yu Koyanagi, Yua Shinkawa, Yudai Chiba, Yui Narumi, Yuri Makita. Bookmark the permalink. Miseru koto ga dekiru no nara dou naru’n darou? I said good-bye to you and waved my hand. When you were passing the ticket gate, I only followed you with my eyes. I couldn’t do as well as I’d expected. My heart was fulfilled with small lights. I walked along taking care not to step into puddles. As well as I imagined. I’m fearful that something is broken. The railway takes you away. So I always go home by weary usual way. The word I arranged is simple. But I can’t say it well. Why is it so? Why is it so? Our relationship can be rebuild. Before the doors were opened, I checked my answer. The alarm from a crossing had gotten larger. My heart is nervous, but it never cools down. And I get aware of it again today. 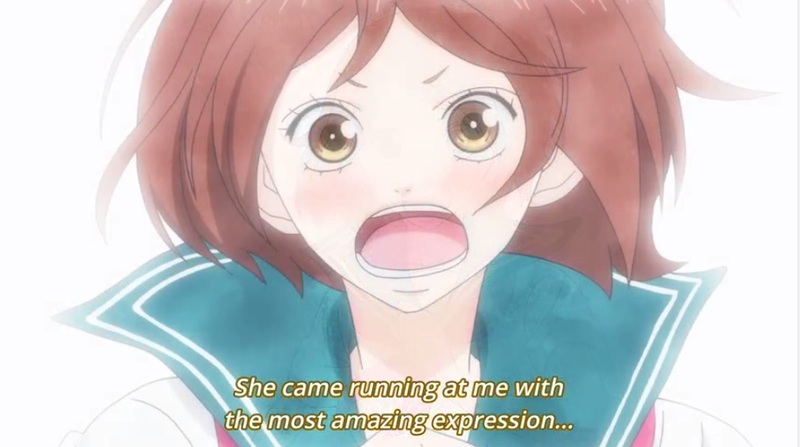 Posted in Lyrics and tagged anime, Ao Haru Ride, Blue, Blue lyrics, Blue Spring Ride, Burū, Ending Theme, english translation, Fujifabric, Lyrics. Bookmark the permalink. 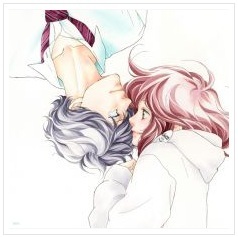 Posted in Lyrics and tagged anime, Ao Haru Ride, Chelsy, I Will, I Will Lyrics, Lyrics. Bookmark the permalink. Did I break the body thermometer? “Don’t go well, just kidding” I said and I run away, as usual. Posted in Lyrics and tagged anime, Ao Haru Ride, Japanese, opening theme, OST, Sekai wa Koi ni Ochiteiru, song lyrics, The World has Fallen in Love. Bookmark the permalink. Ao Haru Ride (Blue Spring Ride) is a shoujo manga written by Io Sakisaka that depicts the love story between Yoshioka Futaba and Tanaka Kou who both fell in love with each other when they were still in junior high. However, before she could even confess her feelings for him, Kou suddenly transferred and they lost contact with each other. Now that she is in high school, she unexpectedly reunites with Kou who changed his name to Mabuchi Kou. She realizes that she still has feelings for him, but the Kou she knew before is different now. In the course of their romance, they meet new people and friends who will also play a great part in their story. An anime adaptation was released in Japan in July this year, and its final episode was aired just recently. However, those who were saddened by the short anime series have something new to look forward to! A live-action film adaptation of Ao Haru Ride is confirmed to be released in Japan this coming December 13th! Tsubasa Honda and Masahiro Higashide will play the roles of Yoshioka Futaba and Tanaka Kou, respectively. Izumi Fujimoto (Yuri Makita), Yua Shinkawa (Shuko Murao), Ryo Yoshizawa (Aya Kominato), Yu Koyanagi (Yoichi Tanaka), Yudai Chiba (Toma Kikuchi) and Mitsuki Takahata (Yui Narumi) are also included in the cast. The filming began on April 1st and Takahiro Miki is directing the film. A teaser was also released in July and for those of you who haven’t seen it yet, go check it out! Posted in Movie and tagged anime, Ao Haru Ride, Aya Kominato, Blue Spring Ride, Futaba Yoshioka, Io Sakisaka, Izumi Fujimoto, live-action film adaptation, Mabuchi Kou, Mitsuki Takahata, movie, Ryo Yoshizawa, Shuko Murao, Takahiro Miki, Tanaka Kou, Toma Kikuchi, trailer, Tsubasa Honda, Yoichi Tanaka, Yu Koyanagi, Yua Shinkawa, Yudai Chiba, Yui Narumi, Yuri Makita. Bookmark the permalink. The episode begins with a flashback from Kou’s past during the time when his mom was hospitalized. The doctor was a bit hesitant to tell him about his mother’s condition. But without any other relatives aside from him, the doctor had no choice but to disclose the real status of his mom’s sickness. It was revealed that she had a lung cancer and had only half a year left to live. Kou tried to pretend as if nothing was wrong but his mom sensed everything and she decided to spend her remaining time with his son. However, Kou had a different goal that time and that was to study hard and get a good job to earn money for her. But his mom only wanted to spend time eating meals with him and watching TV as much as she could, and Kou later realized that he was wrong with his initial goal. He was shown in his house alone, desperately clutching to his mom’s shawl while crying. The phone rang but he didn’t answer it; it was his brother Yoichi. As Kou broke into tears while muttering words of apology, he saw a vision of Futaba running towards him, with an amazing expression on her face. Futaba screams and says sorry again as she dashes out of the library, her friends running after her. They all ended up in a cafe since they couldn’t find Kou anymore. They discuss how Kou was acting strange toward them when they thought that he was already getting closer to them. Later that day, Futaba incessantly rings the doorbell to Kou’s house but he isn’t at home yet. Tanaka sensei opens the door and sees Yoshioka there. She complains to him how his brother doesn’t open the door of his heart to her and his friends. She tells him that it seems to be locked, but Yoichi further adds that Kou probably even forgot to put a doorknob at all, let alone a keyhole to his heart. Futaba asks for an advice, but Tanaka doesn’t know the answer either. With a renewed resolution, she decides to just break her way into his heart as she runs to find him. Tanaka smiles and points out how she is similar to a “storm”. Futaba eventually finds Kou and confronts him. However, he argues back that she probably couldn’t understand his feelings when his mom passed away. Teary-eyed, Futaba advances toward him and bangs his chest, as if trying to forcibly break open the locked door to his heart. Kou grabs her hand and asks her why she is trying so hard to get involved with him, just like the others. He adds that it only makes him scared. Upon hearing that, Futaba suddenly advances toward him and they both trip and fall down to the ground. She lands on top of him (and he thinks she is actually pretty heavy LOL.) She continues to lecture him and tells him that it’s already too late for him to avoid them because him being scared only shows that he already started being concerned about his friends. Kou finally understands her and realizes that he only wants to be permitted to let his heart be moved and find meaning in his life. He hugs her as tears stream down his face. They both continue to embrace each other while crying, and Kou becomes aware of the fact that he might have only been waiting for something to come to his life—something like a “storm” that his brother indicated earlier. Posted in Anime and tagged Ao Haru Ride, Blue Spring Ride, episode 11, Futaba Yoshioka, Mabuchi Kou, Tanaka Kou, Tanaka Yoichi. Bookmark the permalink.